We've had to reschedule it a couple times, but today I'm excited to announce the third in a series of Taste Live events I'll be moderating for Finger Lakes Wine Country (FLWC) in conjunction with their newly launched TasteLive page. As you may have read yesterday, pinot noir is showing great potential in New York, so this should be an interesting tasting that will undoubtedly open up some eyes. And, it's that two of the winemakers so core to my story have wines in this lineup. 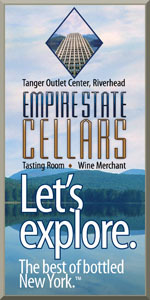 Sounds like a fun event - never had NY Pinot Noir, so I look forward to "watching" the twitter tasting feed. I love this grape (when handled well), so we may need to look outside of VA for wine for a change....at least once in a while. Great! Where can I buy these wines so I can join along at home?